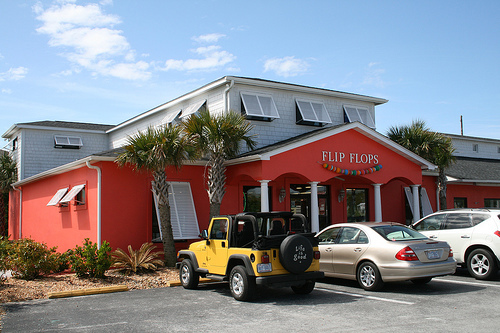 I’m amazed at the amount of emails and comments I receive here at the Crystal Coast Blog from people who think I own the Flip Flops store in Emerald Isle. Then again, it’s really easy to understand. People “Google” the search term “Flip Flops in Emerald Isle” and my Crystal Coast Blog appears on page one (1) of the search results. Naturally, when people read my wife’s favorable comments posted here at our blog about Flip Flops, they assume that my wife Pam and I are the owners. Here’s the thing, we do not own the shop. Good news! Tropical Storm Hannah was actually no worse than a strong Northeaster as they say here on the Crystal Coast and everyone weathered the storm with little fanfare. The storm did develop some pretty serious rip currents and the local surfers took advantage of the high surf otherwise damage was minimal. Future Weather Updates from the Crystal Coast! Stay tuned to the Crystal Coast Blog for more updates on tropical storms and hurricane advisories for the remainder of this hurricane season. Did your Crystal Coast Property Experience any Damage? While I’ve heard of no real property damage to speak of, did your Emerald Isle, Salter Path, Indian Beach, Pine Knoll Shores or Atlantic Beach home experience any damage? Be sure to leave a comment and let us know. 4 Reasons Your Next Emerald Isle Real Estate Agent Should Have an iPhone! Ok, I’m sure this post will get all the Blackberry “Crackberry” loving real estate agents fuming. As a former Moto Q owner, I joined the masses that crossed over to the dark side and purchased an iPhone in mid-July. According to several websites, since the introduction of the 3G generation of the iPhone, an estimated 3 million units have been sold. That’s a staggering number. Based on the many Twitter conversations I follow, a bunch of agents all over the US are new iPhone owners. Great Coffee and FREE Wi-Fi! 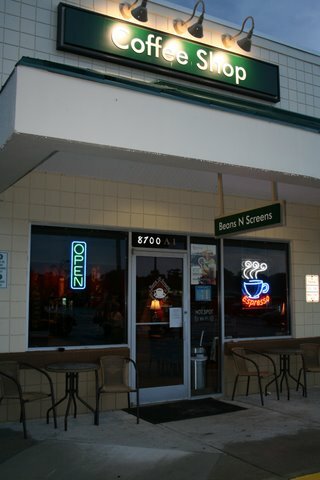 If you are in need of a great cup of joe and a quick surf on the Internet while you’re visiting Emerald Isle, you must swing by Beans-N-Screens Internet Cafe in the Emerald Plantation shopping center. Kim Ervin and her great team of expert baristas will whip up your favorite latte or espresso in no time. Emerald Isle Real Estate Agents – How about this Idea! If you’re out showing Emerald isle condos or single-family vacation homes, why not stop by Beans-N-Screens and take advantage of their free WI-FI Internet access. Even better, why not schedule a regular time each week you will be “camped-out” at Beans-N-Screens to answer questions about Emerald Isle real estate and provide FREE MLS home searches for those vacation visitors who stop by for a cup of their favorite blend. Heck – why not make a big statement and give away a few cups of coffee to your guest! Great Coffee – Even Better Service! What I love about Kim and her staff is they know how to have fun and serve great coffee. From the finest expresso straight from Italy to the best organic grinds, Beans-N-Screens has it all! Your Crystal Coast Blog Recommendation! Beans-N-Screens is my personal favorite hangout for great coffee and free WIFI in Emerald Isle. In fact, I wrote this post while in this very cool Emerald Isle coffee shop and I highly recommend this local business to locals and visitors alike! P.S. Summer hours at Beans-N-Screens are Monday-Friday open 6AM, close at 8PM and weekends Beans-N-Screens opens at 7AM and they close nightly at 8PM. Lately I have been thinking about the direction of topics and information provided in this blog. One key element I teach every blogger is you must know who your audience is and then provide “high-value” content to your audience in your blog. That way, loyal readers will return time and again to read your fresh content. The Crystal Coast Blog Spotted at the Emerald Grill! So we are walking toward one of our favorite casual restaurants in Emerald Isle this past Saturday morning on our way for some breakfast, when we see a printed copy of our Crystal Coast Blog! 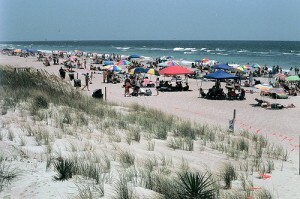 In spite of $4 a gallon gas, large crowds gathered at the Crystal Coast town of Emerald Isle. The beaches were jammed, the DQ was filled with those seeking to satisfy their sweet tooth (hats off to Glenn’s team!) and the restaurants had long lines with equally long wait times (Jordan’s Seafood was awesome Saturday night-we did takeout!). Everyone (locals and vacationers) seem to accept the long lines and enjoy this 4th of July holiday. One of the simple pleasures my wife and I enjoy when traveling from our vacation diggs to a local Crystal Coast restaurant or maybe a round of putt-putt is reading the names of the many beach cottages along the way. 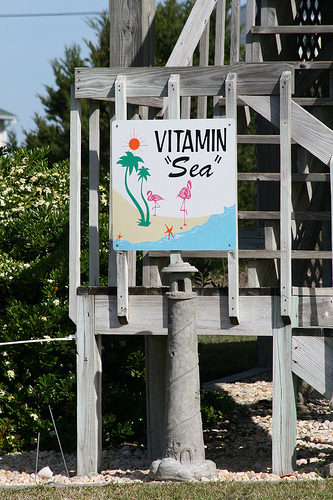 Crystal Coast property owners are so creative with their names of their cottages. What Inspired Your Cottage Name? Many beach cottage names are obviously nautically inspired while others are connected to a favorite college or pro sports team. Some property names elude to a favorite past time or maybe evoke a sense of a person’s character (or lack there of). Some are based on the surname of the owners while others are inspired by a breath-taking scene of natural beauty. Here on the Southern Outer Banks, you might find a cottage named after a whimsical place and time. Whatever you call your property, we are looking for your favorite Crystal Coast beach cottage name and digital photo of the sign/property. Sand, Waves, Shells, Shopping, Putting and Food! A typical week at the North Carolina coast for our family means lots of playing in the sand, riding the waves, long walks on the beach, and more time than you could imagine crouched in the shell seeking position. 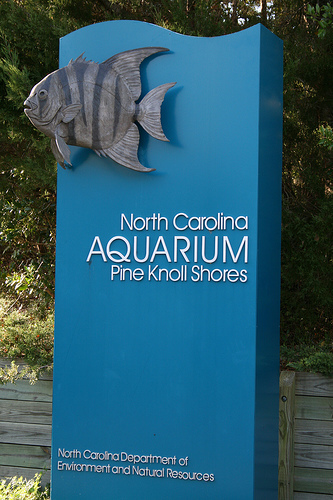 Time must always be allocated for at least one game of miniature putt-putt golf and a trip to the NC Aquarium in Pine Knoll Shores. We always try to venture out and explore new areas, interesting shops and yummy restaurants. These are a few of our favorite Crystal Coast beach vacation traditions.